State Sen. Hannah-Beth Jackson addressed the California state Senate in August on a measure requiring at least one female director on corporate boards of publicly traded companies based in the state. On Sunday, Gov. Jerry Brown signed Jackson's bill. The bill was sponsored by state Sens. Hannah-Beth Jackson and Toni Atkins. "We are not going to ask any more," Jackson said in August in a floor speech on the bill, the Los Angeles Times reported. "We are tired of being nice. We're tired of being polite. We are going to require this because it's going to benefit the economy. It's going to benefit each of these companies." "It's time that we burst that man-cave and put women in the boardrooms," she said. A quarter of the 445 publicly traded companies in California don't have a single woman on their boards, KQED reports. Brown acknowledged that that have been "numerous objections" and "serious legal concerns" to the bill. California's Chamber of Commerce and 29 other business groups opposed the it, sending a letter to the state senate arguing that the measure is unconstitutional, that it takes into account only gender and not other diversity, and that it seeks to manage the directors of companies that are incorporated in another state. "Such confusion and ambiguity will only lead to costly fines as proposed under the bill and potential litigation," the business groups complained. Companies that don't comply with the law will be fined $100,000; subsequent violations will draw a $300,000 fine. 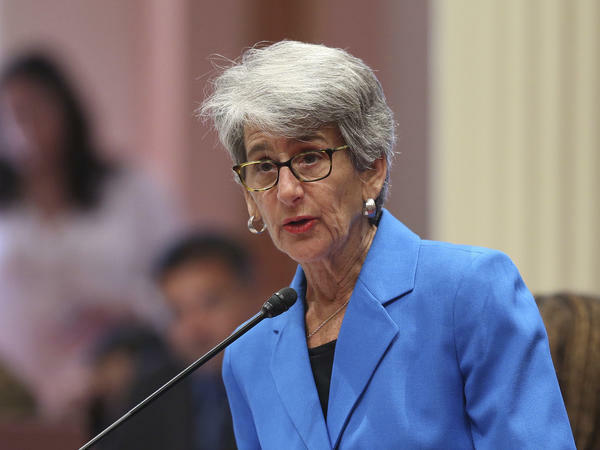 Jessica Levinson, a professor at Loyola Law School, Los Angeles wrote that "the bill specifically creates a classification based on gender, and therefore it raises questions of equal protection under both the U.S. Constitution and the California Constitution. When the government legislates on the basis of gender, courts typically subject that legislation to a heightened scrutiny. This basically means the government has to prove it has a really good reason for doing what it is doing, and that there isn't a better way of accomplishing that goal." Just 5 percent of the companies on the Standard & Poor's 500 (which includes only publicly traded firms) have female CEOs. According to The New York Times, women who have served as chief executive are far less likely than men to go on to be CEO at another company, and less likely to serve on corporate boards. In 2008, Norway instituted quotas requiring women to make up 40 percent of directors at listed companies, and many countries in Western Europe soon followed, as The Economist reported in February. "In every country business leaders protested when the idea was floated," the magazine noted. But ten years on, "the worst fears have not been realised." One concern – that a small group of women would end up on many boards – turns out to be an issue with men on boards, too. The Economist also found that some of the benefits touted for increasing the number of women on boards – such as closing the wage gap between men and women, or having an effect on company decision-making – haven't necessarily come to pass. The bill was one of Brown's last opportunities to approve or veto before he leaves office due to term limits, The Associated Press noted. The approval also took place against the backdrop of the controversial Supreme Court confirmation process of Judge Brett Kavanaugh, who is accused of sexual assault more than 30 years ago. In his statement on signing the bill into law, the California governor pointedly cc'ed the U.S. Senate Judiciary Committee and wrote: "I don't minimize the potential flaws that indeed may prove fatal to [the law's] ultimate implementation. Nevertheless, recent events in Washington, D.C.—and beyond—make it crystal clear that many are not getting the message." He noted that as far back as 1886, corporations have been considered persons as far as the 14th Amendment is considered. "Given all the special privileges that corporations have enjoyed for so long, it's high time corporate boards include the people who constitute more than half the 'persons' in America," Brown wrote. Jackson, the bill's co-sponsor, told USA Today that the law is "a giant step forward not just for women but also for our businesses and our economy." "It's my hope that corporations, rather than fight this, will acknowledge its value and take the lead on pulling together and bringing greater diversity into their boardrooms," she said.